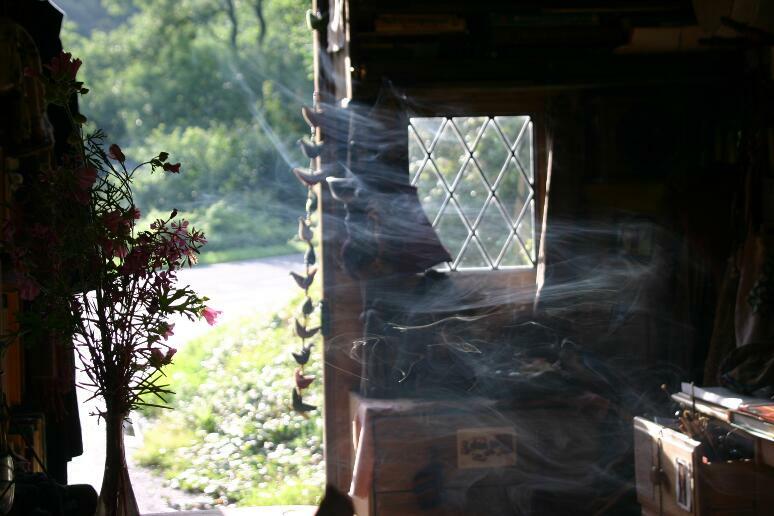 A while ago I wrote an article for the wonderful Earthlines Magazine about my previous experiences of living a travelling life and my reasons for continuing to desire it, so we thought we’d share it with you here to go some way to describing some of the deep and heartfelt yearnings that are at the root of our wanting to make Hedgespoken happen. Wheels have turned in my life since before I can remember. 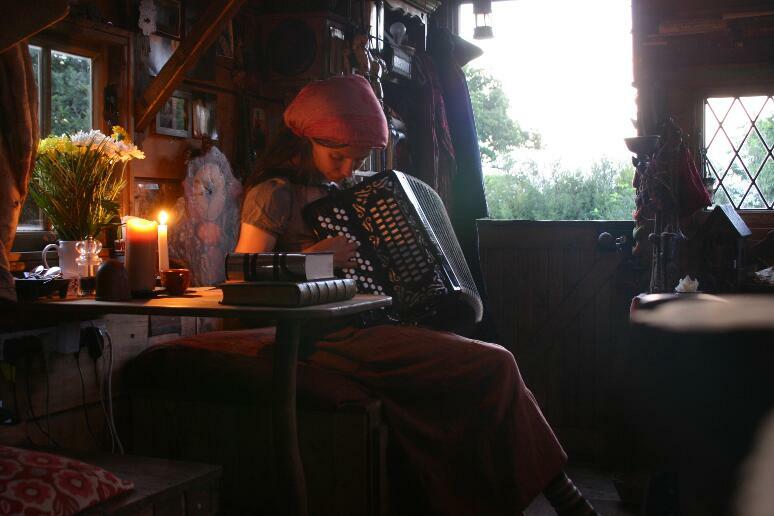 The characters in my paintings are wheeled, their houses are wheeled; my stories are wheeled. Handcarts and wagons and caravans have always drawn my eyes, in that urgent, beautiful way a well-loved colour or a certain kind of face stands out in a crowd. Wheels call to me even louder if they have a door, a window or a chimney atop them. Something about the combination of vehicle and house sets my blood thrilling. Travelling, I have gradually realised over the years — and more specifically, living in a house that moves — is a fundamental part of the person I am; it’s what makes my heart sing the highest, and my feet feel the rightest. Before I’d spent a year in this world, my parents decided to travel with me, their first child, to the Bavarian Alps to learn from the old woodcarving tradition in the villages there. 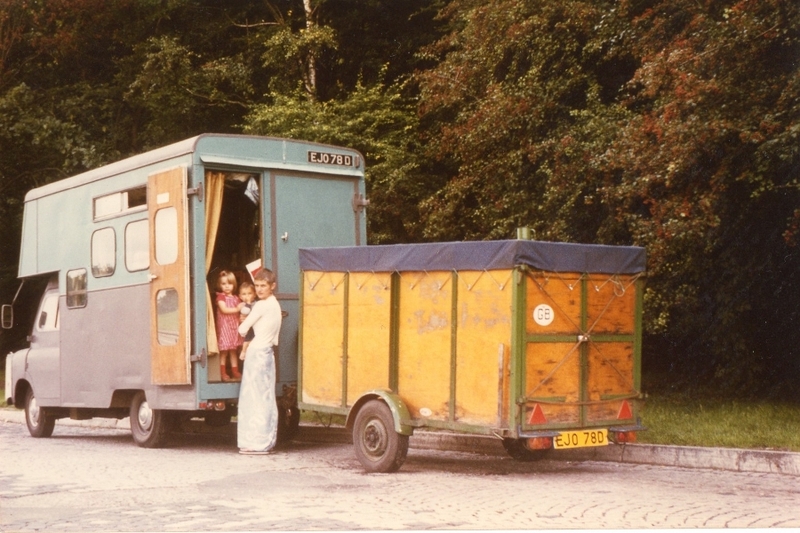 I was only a few months old when they bought an old Bedford CA removal van and converted it into a live-in vehicle, with wooden cupboards, a tiny kitchen, netting on the ceiling for storing and airing clothes and a little trunk-bed for me. I am not sure whether the seed of the travelling life was planted then in me, but I know the memories are vivid and beloved. 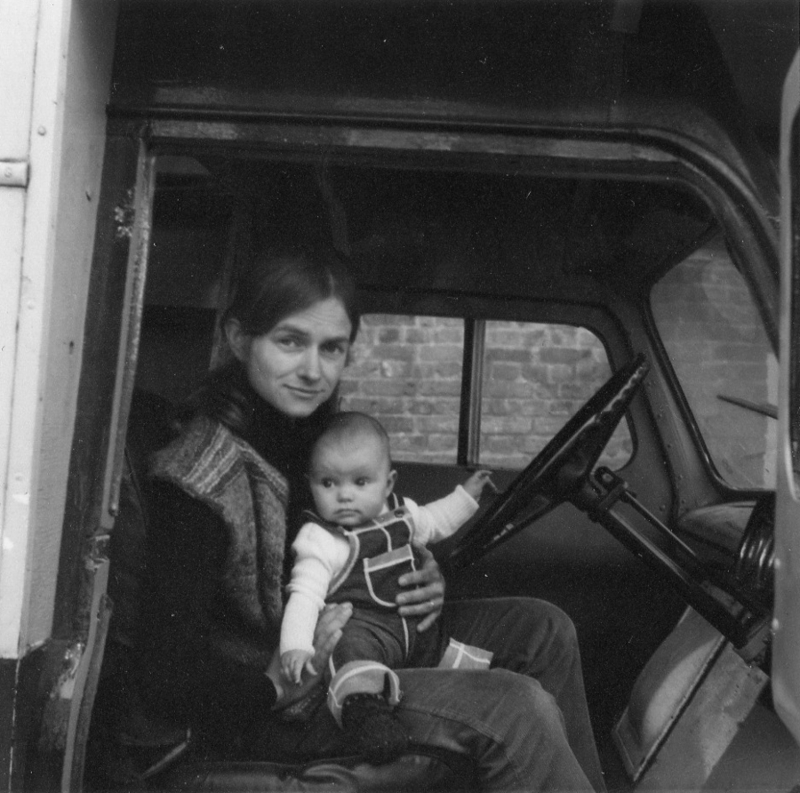 I had my first birthday in that van, and as I got older, my days were filled with undulations of mountain and river and forest. In Bavaria, my Dad would cycle into the village each day to work in the woodcarving workshop, returning with a hunk of wood which my Mum would clamp to the tail-gate of the van and carve, whilst I amused myself in a baby-bouncer strung in the van doorway. They got paid by the piece, and we survived on these small earnings and the kindness of neighbours and nuns. This was our life for a few years, though we moved into an old house when it got cold, and came back to London for a while when my brother was born. When I was four, we were given just two weeks to pack up and leave Germany because of visa troubles. I’m told that I would not look my parents in the eye for weeks after they brought me back to the concrete and and taxi fumes of London, but that is where I went to school and grew up. My dreams never grew less vivid, though, and I painted all this time. I dreamed of colourful caravans and houses made from moss at the roots of trees growing far from here, in earth unencumbered by paving slabs and billboards. My first home of my own was a little basement flat underneath an unusual thatched house in West London. Behind the house there were several acres of overgrown woodland with a natural spring, where I could wander and pretend I wasn’t in the city whilst I hung on there and tried to find out how you made a living as an artist. This place was named The Hermitage – whose name I took onward with me as a casket for my art, a business name and a kind of ethos, too. From here, one day, I left for Scotland and the hills of South Lanarkshire. 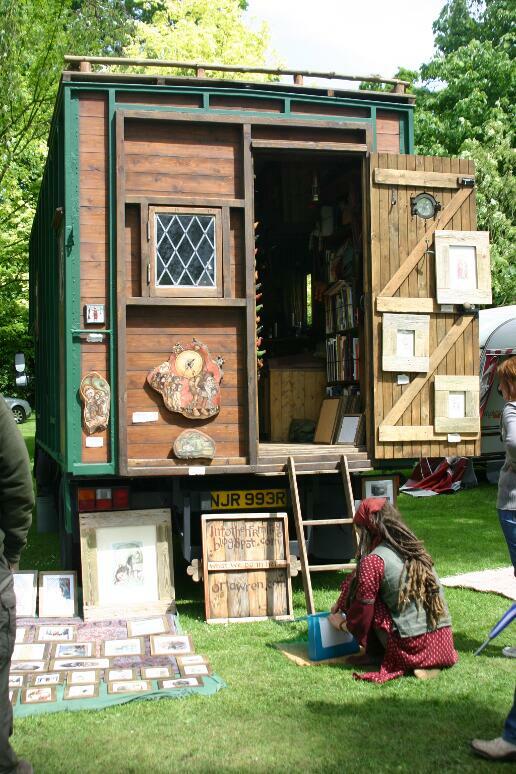 My then-partner had lived in vans as a musician and we began to travel and sell our art on the streets of Britain, scuttling back to the Scottish cottage in between and making plans for a more permanent journey. 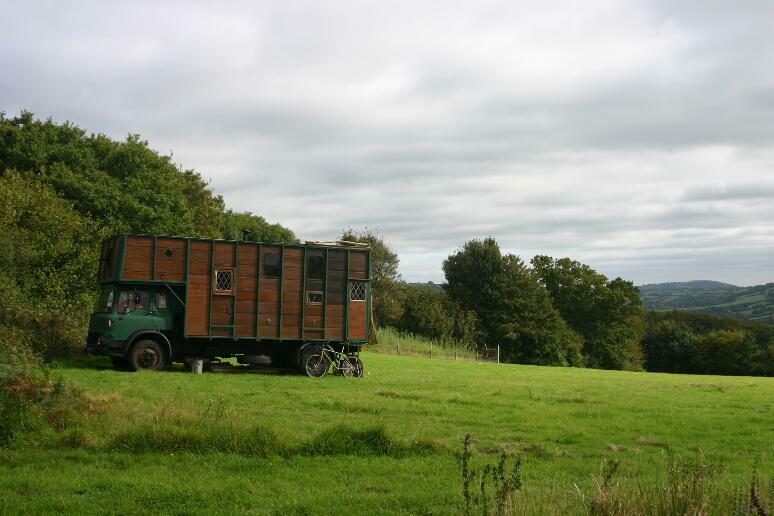 Eventually, we found an old 1976 Bedford TK wooden-backed horsebox for sale. 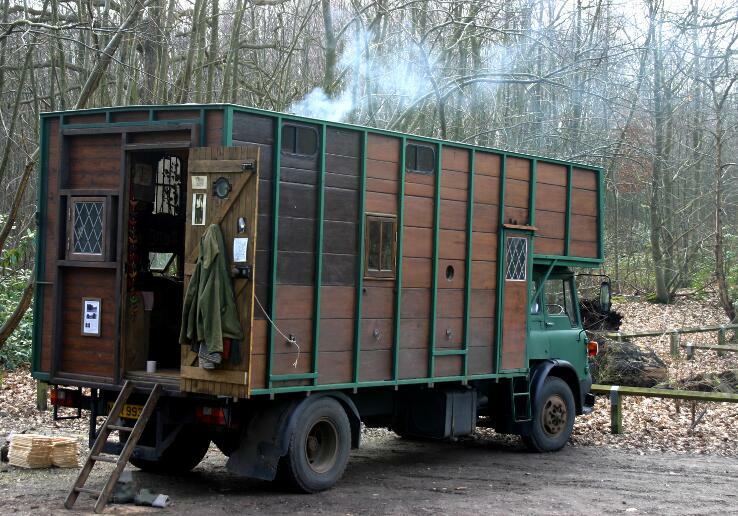 It took a year to turn this truck into a home. The original wooden sides were left for their beauty and hoof-marks. 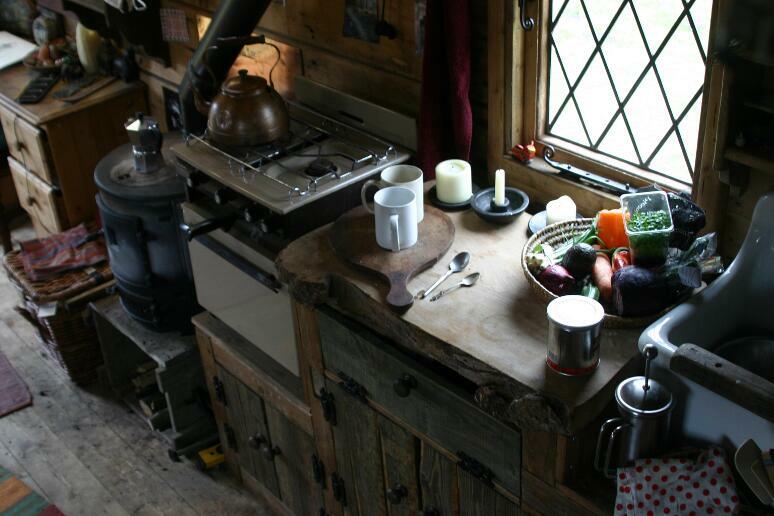 Over time, we added a stove, portholes, and leaded windows from a Welsh chapel. The heavy tailgate was replaced with a front door and window. Storage (of utmost importance in a small space) was built in every corner, as were bookshelves. We put in a painting desk and a little kitchen with an old belfast sink, with a brass pump tap from a boat. We left Scotland as the first snows fell. We would arrive early in the morning to a town and scout a good pitch, sure to respect those who were already there. We would prop our small prints along a wall and then a day of clear dry weather with a good crowd of passers by could yield good earnings. There was always abuse from jeering youths and/or snooty folk who “did not want our sort here.” Not to mention the mad, lurching world of the street, which you only come into contact with once you stop and become part of it for a time: most of those walking about do not really see a whole layer of rough, beautiful, hard and complicated life that exists in every town and city. The biggest obstacle of street selling is the law. Police and council officials would often ask us to move on, since we were not sticking strictly to the requirement of the pedlar’s license to keep moving. There would follow an experiment on our part to see if we could talk with this person on a human level, leaving aside any preconceptions. We’d explain that we understood they were just doing their “job”, but that this was our “job”, and no matter the outcome of the conversation they’d be paid at the end of the day, but if they moved us now, we would not. We encouraged them to see beyond the “rules” or at least to question them: this was our own hand-crafted artwork, we were bringing welcome colour to the town, we were not harming nor negatively affecting anyone else. Often they let us stay for a couple more hours. The council officials were usually less accommodating. Occasionally, too, we’d find ourselves on a stretch of street that was apparently not public at all, but guarded by private thugs in fluorescent jackets with walkie-talkies. Heroin addicts would sometimes slope up and steal pictures to sell, and the drunks and nutters would always make a beeline for us. I loved it though: it made me brave, and I felt very warmly toward that world. The townspeople loved it too – these colourful and unusual pictures and folk who’d made them appearing one day in town from somewhere else, and gone the next day to whoknowswhere. As well as the streets, we attended fairs and festivals to sell our work, and our road was mapped between them. Since the Criminal Justice & Public Order Act of 1994, this way of life has been all but outlawed, and so finding park-ups had to become a cleverly thought-out operation. Scotland is more spacious and friendly, but England is so tightly packed that finding a hidden green space is extremely difficult. For one or two night stops quiet lay-bys on country lanes and forest parks were perfect. There always came the dog-walker though, or park warden, who would either be friendly and come and chat or else phone the council from a safe distance. 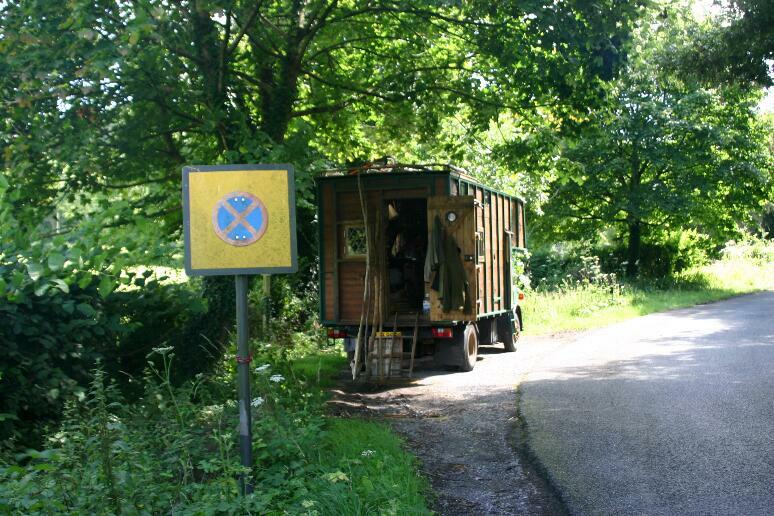 England is full of curtain twitchers, terrified of the unusual, and these folk are quick to report “Travellers” to the council. We never had long in these lovely leafy liminal places. We endeavoured to always be the tidiest, most quiet, polite and considerate of travellers, so as to counterbalance the enormous prejudice that was always weighing heavily against us before we’d even arrived at a place. 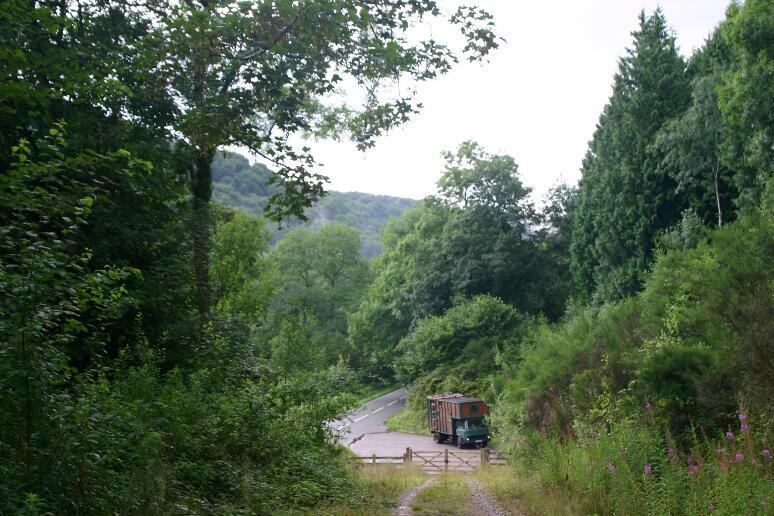 If a longer park-up was needed though – and you really cannot keep moving every day – landowners’ consent was required. 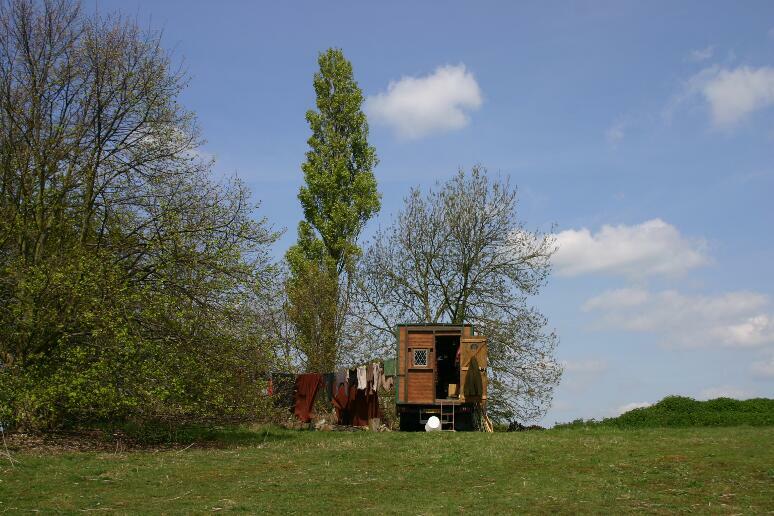 When a landowner had invited us, there could be a time of relaxing, of getting on with paintings, of walking the woods and the hedgerows, of washing clothes and doing repairs to the truck without the fear of having to move again too soon. The pressure is strong, though – one day, one friendly landowner had a call from the council: “We’ve been informed that there are some travellers on your land, and we’d like to know what you intend to do about them?” Our host could have argued that we were his guests, but he had plans to convert an old barn that stood in the orchard, and for that he’d need both the council’s and the neighbours’ goodwill. And so he asked us to leave. We left with a bad taste in our mouths. Bedford TK parked up on Somerset roadside. NB “No Stopping” sign! 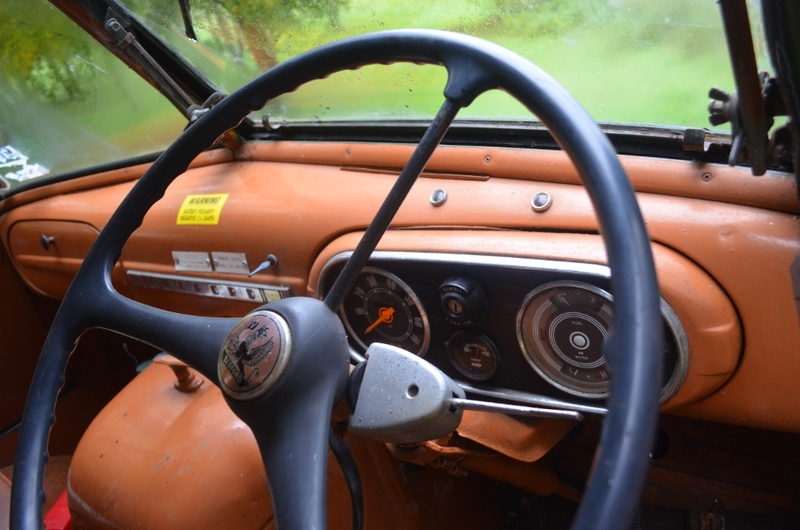 Life on wheels is raw, and hard work, and real and wonderful. Our firewood had to be collected and sawn and chopped and stacked under the truck. All our water had to be collected from the nearest tap (which was often not very near). I would boil an egg for breakfast and save the hot water to wash up with afterwards. 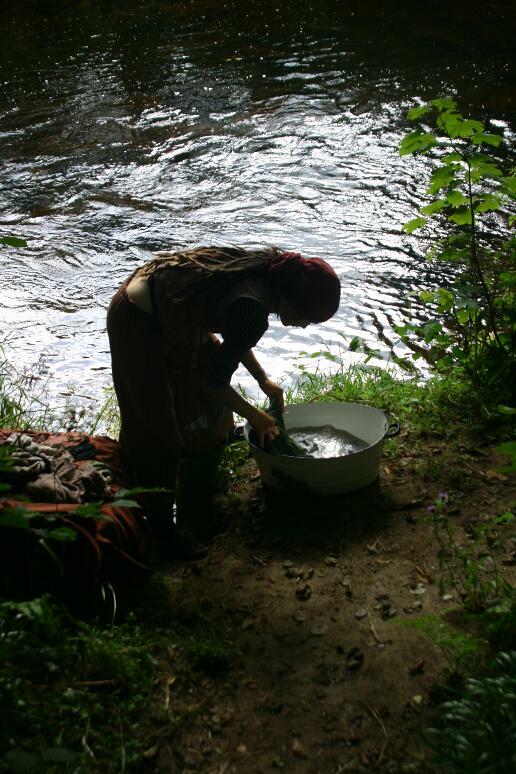 Most vital clothes-washing was done in rivers, or launderettes when they were near. We had a small tin bath which hung on a hook. I boiled water on the woodburner in the evenings in a jug, and used this inch of water to wash in the tin bath. When a kind person offered a real bath, I gratefully accepted. There is nothing quite like the joy of a hot bath when you haven’t soaked all your skin in one go for weeks. View from the round bedroom luton window, Devon. 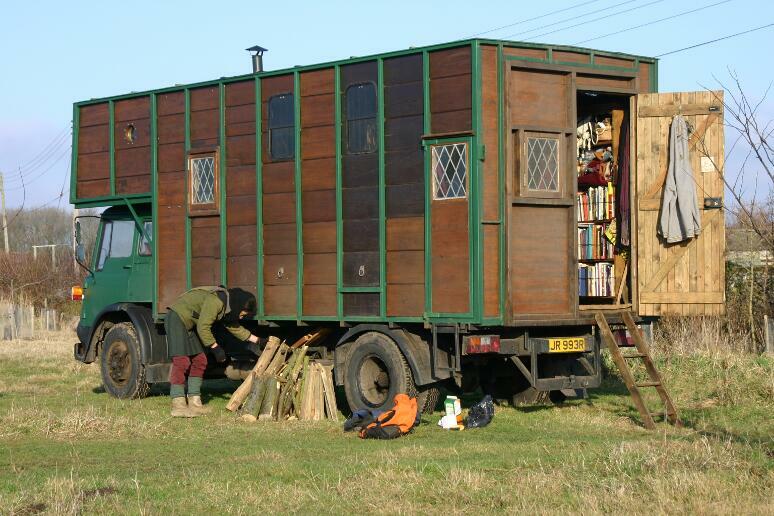 Rima stacks just collected-firewood beside truck, Kent. I have thought long about the itinerant life, and the reasons for my loving it so. There is something inherently wonderful for me about the woodsmokey chill autumn air framing the scene of a live-in vehicle parked in a green lane, chimney askew, bundles of tat against the wheels. Life on the move is vivid, full-colour, in the same way your holiday memories stay with you: brightly captured in your reminiscences. The travelling life is constantly like this, because you are forcing change upon yourself more than is usual in a settled life. The fact that the views from your windows are ever-changing causes you to live in real time: always learning, always seeing with fresh eyes, always experiencing new things. As a result, time slows down. It passes as slowly as it did when you were four, when next week felt like another country. This seems like a wonderful sort of magic to me. Another fundamental difference to the settled life for me is the relocation of what could be called your ‘personal mandala’, your sense of “where everything important is”. In a house, you are inundated with bank statements, tax-returns, your hours spent on the phone to a robot in another country to discuss your phone, your stuff, with the endless spewing boxes, the piles of paper, the drawers containing warranties for dishwashers, and cupboards of plastic things you might need, the internet, more chairs than there are bottoms in your house, twelve different frying pans, hoover attachments, paper shredders. Just reading that list makes me stop breathing. 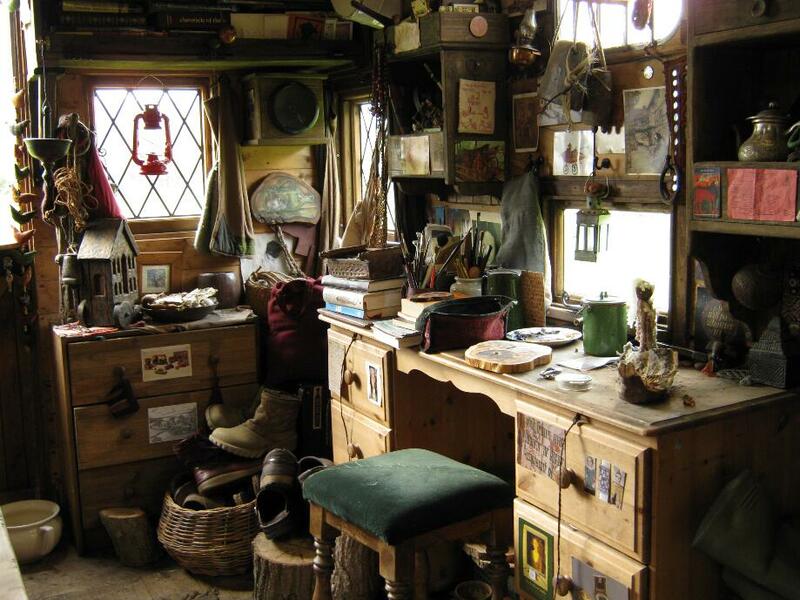 If you live in a wheeled home, everything you need is always with you. When you travel all the time, your kitchen is always with you, containing only the small amount of things you’ve decided you need to cook with. Your work is with you, your tools are with you. You do not have a letterbox. You can only have as much stuff as will fit into your small space. That’s enough. View from the back door, Devon. By becoming snail-like, you choose to relocate your personal mandala to where you are (and where it always should have been); this gives you an enormous sense of relief and release. I loved the space in my days that was freed by needing not nearly as much money to survive and by having my mandala close about me. It is a beautiful irony that moving allows you to be still. Living in your own wheeled home makes you deeply consider what is important to you in a home. This is likely different for everyone, but I’d wager there are some requirements in common. 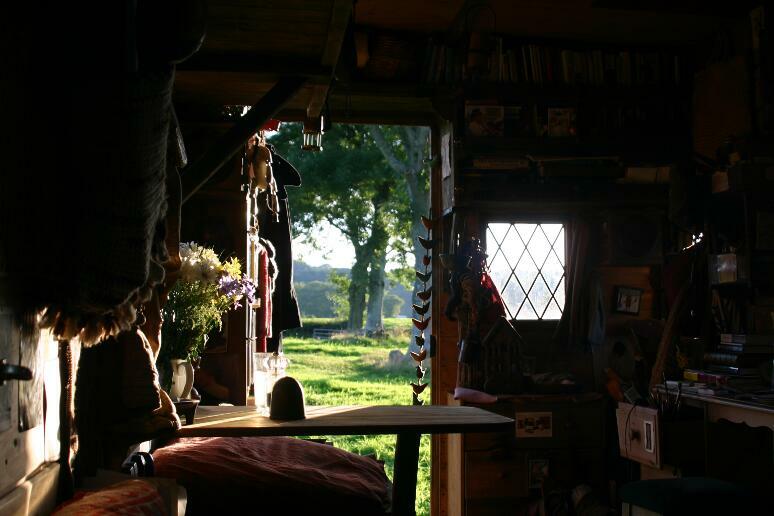 For me, I realised, the vital things that I need to make a home are: warmth, a proper mattress, the wherewithal to make tea whenever it is desired, drawing & painting materials, books, music, and beauty (and I mean the beauty inherent in the home’s structure and decoration – my home has to be beautiful). The other vital reason for my loving the travelling life is the relationship you have with nature – so much a part of us, and yet, in a house, so very far away. 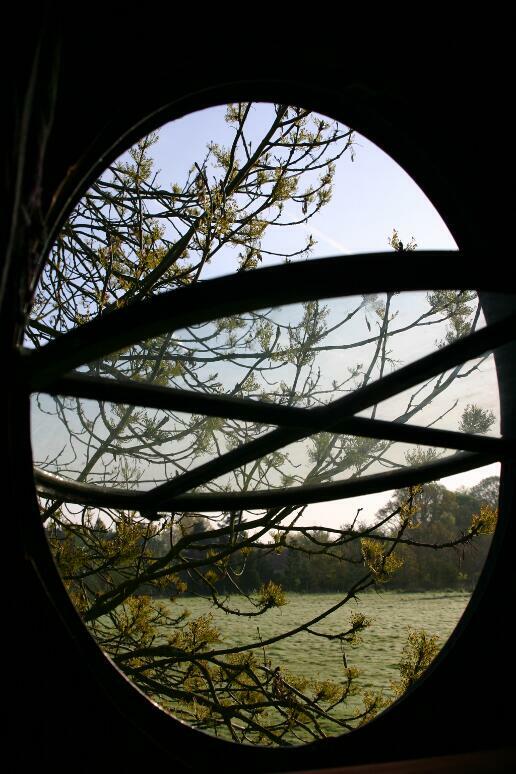 Somehow, when I’m in a house – though it sounds ridiculous when I say this to people – the trees, the moor, the grass, the wrens, the stitchwort, the buzzard, the fox, the gorse, the rain, the wind and the blackbird’s song all seem a very long way from me. When you live in a house, you decide to go for a walk to experience these things, then you come home, and they remain out there. When you live in a more temporary structure, you must go in and out all the time to collect wood and water and to wee; this makes your walls more permeable. The outdoors comes in, too: in the wind, your house rocks like you are at sea. You lie in bed listening to the tiny scuttles of squirrel feet above your head. It is a wonderful thing to step out of your door straight onto grass. Bedford TK parked up in an Essex field. Washing hanging to dry. 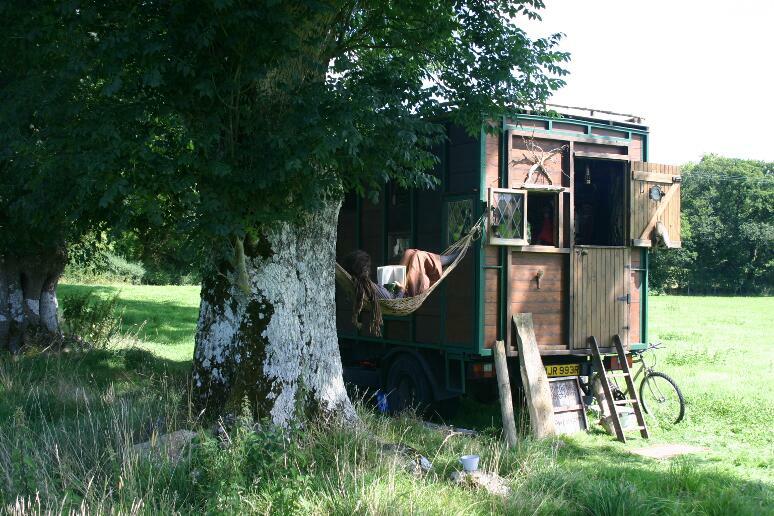 Rima reads in a hammock tied from tree to truck, Devon. In the end, I stopped living in my wheeled house because the relationship ended, and the truck had to be sold. The loss of my itinerant life was a cause of great mourning for me. It was a strange and surreal time. In order to move it on quickly, I ended up selling the TK for the same amount we paid for it back when it was still just a horsebox. It has since moved on again, and will be the home for a family who live in the woods and who have just lost their previous shelter to fire. This change in my life circumstances happened on the edge of Dartmoor. On reaching this place, I felt a strong and physical tug from within the granite and moss of these moorland-edging hills. And I felt it from the people, too. There was such a robust, vibrant and interesting community of kind people who held me to them and welcomed me in a way I’d not experienced before. So here is where I fell apart and here is where I decided to stay. I have found my rooting place. But here, with Tom, we still long for a simpler, more vagabond life. 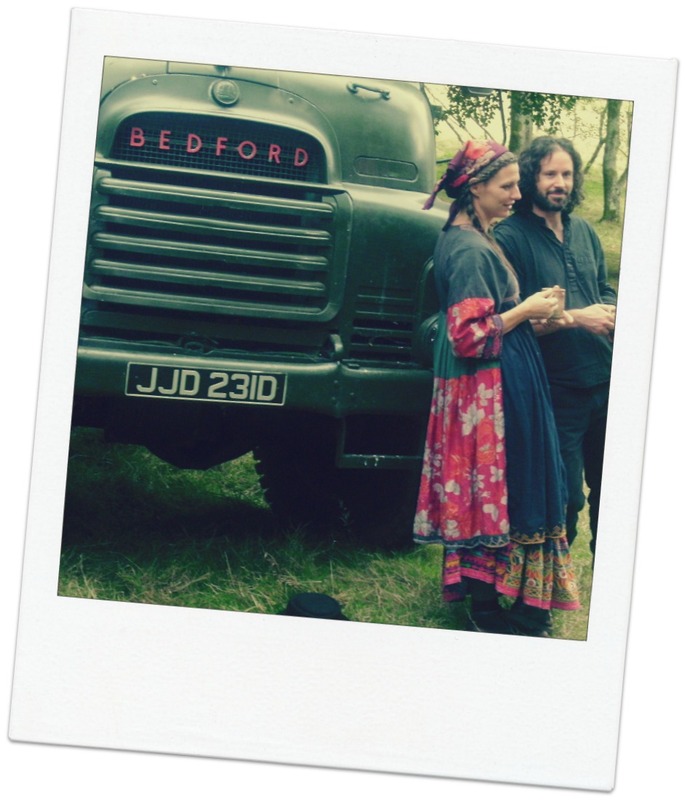 I am happier now than I have ever been, but all the time I have lived in a house, I have continued to often dream of that Bedford TK, to feel like an intrinsic part of me is on hold. The longing I feel physically whenever I see another live-in vehicle is almost unbearably strong: it is that strange and terrible feeling of watching pass by the life that you know you should be living. 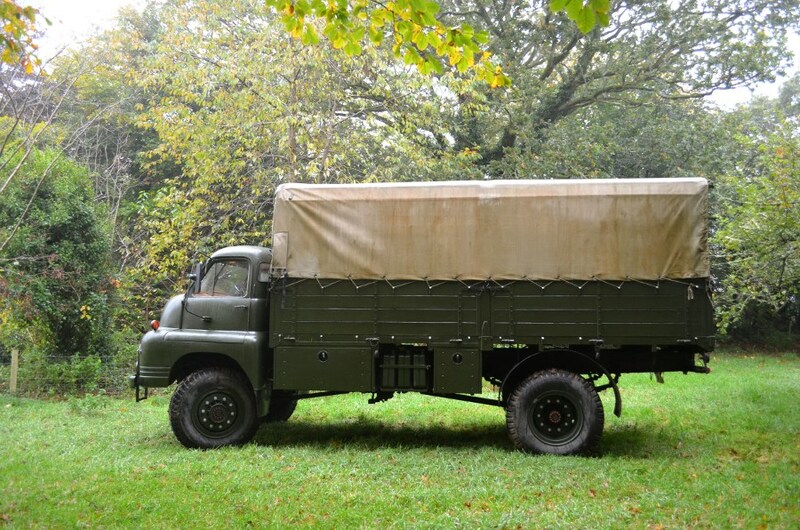 This is why, in the field behind our rented house is now parked an outrageously beautiful vehicle – a pre-1960 Bedford RL lorry. We go out and sit on the tailgate, dreaming of the return to a travelling life which is now so much more tangible again. My dreams still have a live-in vehicle in them, but as soon as we made this purchase, my dream-TK was replaced with this new wonderful RL. We may appear to face a dilemma: the desire to be travellers, vagabonds, wayfarers who have also rooted in a particular place, in a particular community, but our keenness to live like this stems not so much from a desire to go away as from a longing to leave walls behind, to live more simply and immediately and wildly, and to move around as we feel, with our house and our stories and our kettle and our puppets and our acupuncture practice and our paints and our memories and our musical instruments and our boots and our bed and our books and our family and our fire and our free-roaming imaginations, and always the wheels turning beneath us as the skies turn above us, ringing with the clear music of life lived true to its calling. 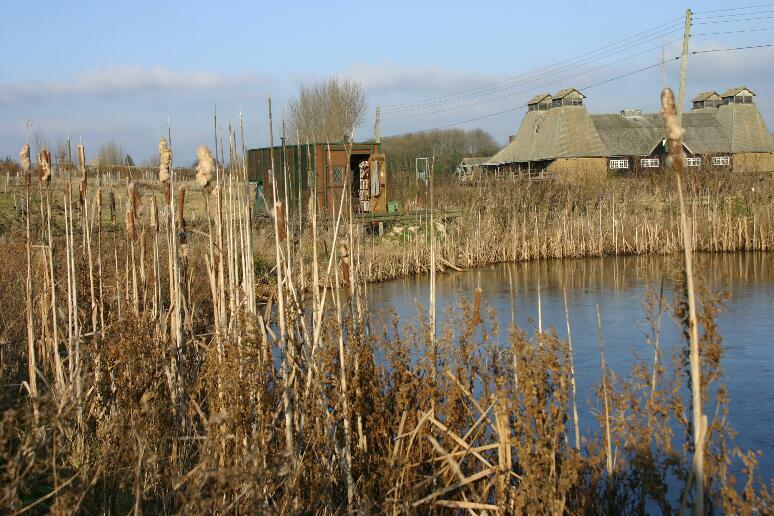 This article was originally published in February 2012 in Earthlines Magazine – a wonderful publication put out by Sharon Blackie (of Re-enchanting the Earth) which focuses on our relationship with the natural world and the culture and lore of place. We heartily recommend you subscribe to it! If only the tightly packed curtain twitchers could move the real curtain aside and see what a wonderful world is out there. I watch each day and hope you and Tom get to make up your caravan of wonder. 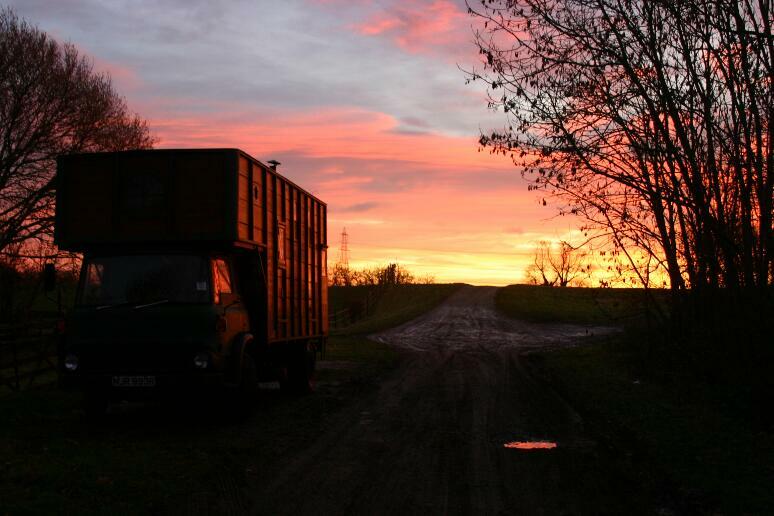 Beautifully written – takes my breath away and I’ve never even desired a travelling life. Although I feel that if there was porcelain w/in walking distance, I could live in the woods for life – doesn’t really count, I know! 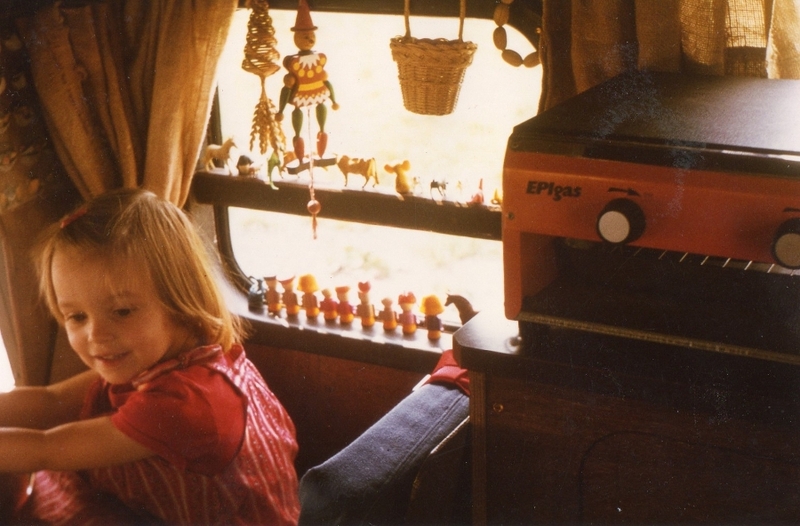 :) I love all the pictures, too, an evocative portrait of an intentionally crafted travelling life. I agree with hillsofnottingham that if people pulled the curtains aside, the wide world would be in their faces and perhaps there wouldn’t be so many strictures and rules about how a person can live. I read the original post and re-reading today I breathed out deeply at exactly the same point. I couldn’t live this way although I love the idea of it. I truly hope you get to live your dream again and when you do I hope you’ll sometimes put out a blog post because I will miss you. thank you for this beautiful glimpse into your life and dream….’all that wander are not lost’ comes to mind… and one can see that you are beautifully and simply living in a way that there is no need to fear…and many will be inspired by. I lived like this for time when my first 2 babies were born but like you, a relationship ended and I’ve been within walls ever since. I still love to be on the move though! You describe your life on the road so beautifully. A beautiful article, and a wonder-full insight into the travelling life. I have been reading of your plans with much interest…to see you both making your dream and vision a reality is very inspiring. It is a most magnificent and magical scheme! That was lovely to read, thank you. It provided a lovely re-visit down memory lane of wheeled living and wee stops, fortunately most of my time was in Europe and warmer climes. But most of all it brought to mind my boat dwelling times. The times when the thin walls that contain your home and you are barely more than an extension of the elements. Being in the middle of the ocean you understand how you are a mere speck in the awesomeness of nature, I should imagine the being buffeted on a hill top, through winds and rain has much the same feel. I came here from the ‘Shelter’ blog, because one look at the Hedgespoken idea showed me it was very similar to what my wife and I would love to do. Now I’m coming to the end of a 3 year apprenticeship as a cabinet maker/joiner, partly to get the right skill set to follow our dream, and thoroughly frustrated at the way almost everyone has tried to steer me away from that idea, and away from traditional woodworking and forests, and towards the corporate world of chipboard furniture and machines. They failed, but it is a fight even now. 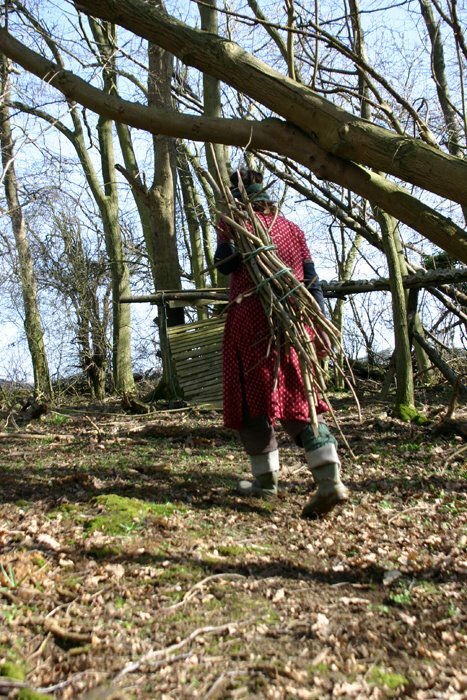 I’m not able to support you financially, but my ill-thought through, spontaneous idea was that I could be a woodworking pedlar and help build Hedgespoken in return for a bed and food for a couple of weeks next year sometime. Of course my selfish motivaion would be that I’d have a chance to get back in touch with storytelling and into the culture in the UK -having left in 2001- and be able to see if we could build our own future doing something a bit like you are, albeit far away from Devon. Is there any possibility we could help each other in this way? If it helps, I lived in Somerset and Devon before I hauled myself out to Germany, so I’m kind of local.